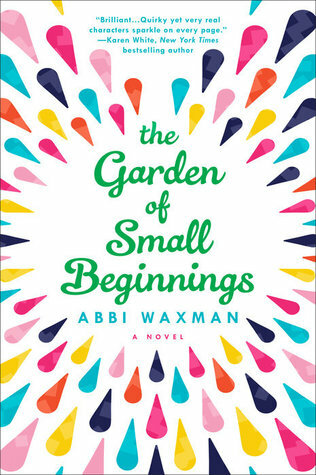 The Garden of Small Beginnings by Abbi Waxman is a 2017 Berkley publication. I admit I started reading this book with a certain mindset. I was thinking contemporary fiction, maybe some romance, maybe not, with 'mature' adult characters, and I was right about that much, but whatever else I might have been thinking, was totally blown out of the water after reading the first chapter. The story deals with some heavy topics, but it was absolutely hysterical. I laughed all the way through it, but it was also a moving and bittersweet journey. Lilian Girvan is going through the motions of living. She has a good job as a textbook illustrator, but it’s not all that challenging or fulfilling. She’s the mother to two little girls, sister of Rachel, a free spirited woman who would do anything for her, ... and a widow. When Lilian’s husband, Dan, is killed in a car accident, Lilian nearly died from a broken heart. 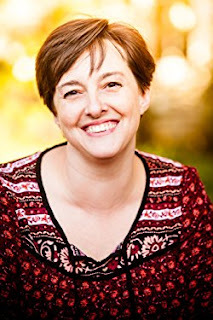 She spent a little in -patient time in a mental hospital, and might have entertained a few suicidal thoughts, but now, she’s able to simply exist again, not actually living life to its full potential, but getting through one day to the next, nursing her grief, unable or unwilling to let go of it. But, the thing is, Dan has been gone for three years, and those who love Lilian would really like to see her start moving forward with her life instead of walking in place. As fate would have it, Lilian’s boss signs her up for a gardening class to appease a new client, and out of this random and seemingly benign event, Lilian finds her entire world opening up to new possibilities, as she forges an unexpected relationship with other members of the class, not only learning to cultivate vegetables, but also new friendships, stronger familial ties, and maybe even the strength and desire to begin dating again. This novel explores various themes, such as the relationship between sisters, first impressions, unexpected experiences that can steer us in a new direction, and the simple act of enjoying a new hobby, such as gardening, which may initially seem challenging, but turns out to be quite therapeutic and fun. Humor is a tool some people hide behind when under duress, or as a coping mechanism. Both Lilian and Rachel were able to lean on this ability to get them through some tough times, but it also helped them communicate with each other without one taking offense and kept the tone light, despite the palpable pain Lilian was suffering. It was a fascinating dance between the sisters who stayed close despite their differences. Their relationship appears to parallel the relationship between Lilian’s own daughters in a way, with one being very sensitive and the other showing an unflappable approach to life. The students taking the gardening class, and the teacher, all have a role, and each one shares their unique background, which adds depth and character to the story, fleshing it out, and bringing much needed variety and color to Lilian’s life. For those looking for romance, this book does have a few promises and hints of budding relationships, but this really isn't a romance novel, in my opinion. It is more about Lilian’s long journey out of the dark grip of grief, her healing and eventual personal growth. Lilian learns to face her fears so that she can be a better parent, sister, and friend. She must first learn to care for herself, so that she can fully take charge of her life again. The author did an amazing job of capturing Lilian’s melancholy and vulnerabilities, while also accentuating her humor and wit. She was a delightful character, and I instantly warmed up to her, and knew I was going to enjoy getting to know her. When Lilian is finally able to think of others, to draw her attention away from her inner struggles, she is able to reenter life and truly become productive again. Lilian steps out of her perpetual gloom, into the light, kicking and screaming, fighting it every step of the way, but once she finally steps into the sun, the welcoming brightness sent rays of hope to warm her fragile heart and weary soul. The gardening tips at the beginning of each chapter was a nice touch, and as a gardener, I found many of the suggestions useful, as well as charmingly funny. Overall, this is just the type of all around inspirational feel good story I need sometimes. There is no absolute- 'and they all lived happily ever after'- conclusion, exactly, which, under normal circumstances would really tick me off, but in this case, I didn't mind so much. Lilian’s reluctant pilgrimage sucked me into another life, took my mind off my own troubles, while I cheered her from the sidelines, watching while she blossomed back to life, while touching my own life.